Notes: I knit the top portion of the stocking flat, rather than in the round. I started by casting on 70 sts on smaller needles and did 1x1 ribbing for 6 rows. On the next row, I knit, switching to larger needles and decreasing 8 sts evenly across. I left a long tail from the cast-on, which was later used to form a crochet chain for the hanging loop, as well as to help form the seam. 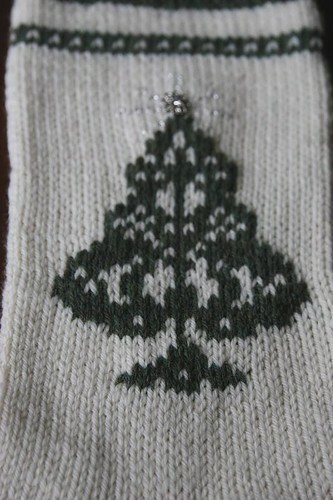 The Christmas tree motif comes from Eli’s Christmas Stocking by Meg Swansen and that portion of the stocking uses a hybrid of intarsia and stranding. I don’t have a lot of experience with colorwork, and it shows. 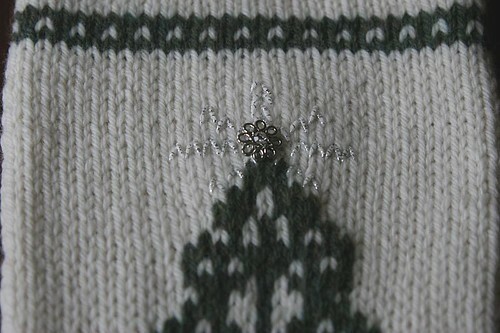 You can see how the columns of stitches pull in where the Christmas tree is. The “star” at the top is a button sewn on, and Berroco Lumina is duplicate stitched around the star to produce a bit of silvery shimmer. 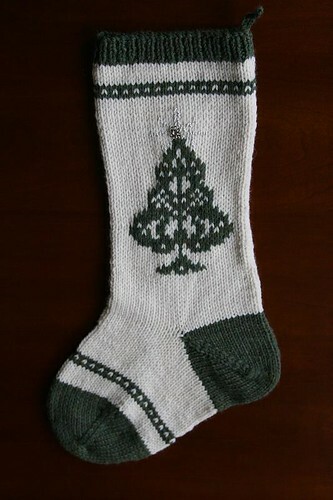 After the Christmas tree was completed, I joined to knit the remainder of the stocking in the round.